This is one of your most interesting P-47 permutations yet, Tophe! I bet it would also make a great flying boat with a hull on the bottom. I bet it would also make a great flying boat with a hull on the bottom. "would"? Do you know dream of the Consolibrian PB-47? Officers of propaganda Official Historians have always claimed it never existed for Real! When I least expect it, you go and take it to the next level! Outstanding! I really like how you kept the "glass" nose. This baby would be perfect for some sightseeing down the River Meuse. Your work and imagination is a constant delight, mon ami! The top one would be a beast!!! The top "Lighterbolt" reminds me of the P-68 Black Widow, minus the rear gunner/recon station. Now that bottom "Lighterbolt" is what the famous Blohm & Voss observation prototype wishes it could be. Your wonderful ideas never fail to delight me, Tophe! Thanks BdB to have smile with me about douple-planes and asymmetric ones, but let us be serious now: let us talk about... SPATS! The Republic design bureau has been very wrong selecting a retractable landing gear for the P-47, this device being heavy and complicated (with crash of the airplane if there is any problem!!). No, the Spatterbolt (below) was the good one, but which: tail-wheeled or nose-wheeled? 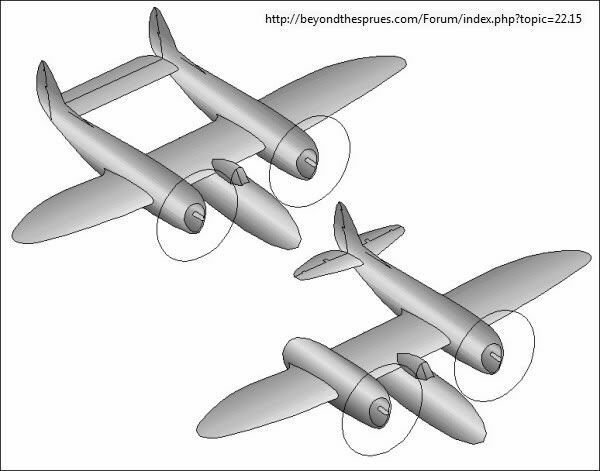 Its been waiting for me to envision it all these years and I never did - the four engine P-38. 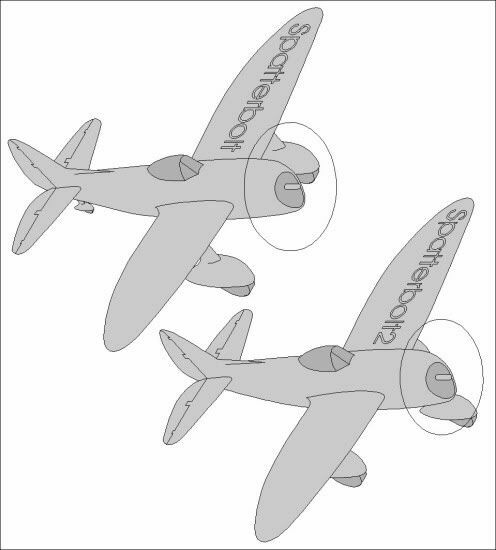 Concerning the P-47 with spats, I think the main reason is this argument for Republic towards USAAF: "if you want streamlining with few hp, buy those anemic Mustangs of yours, but with a huge engine and much hp vitamins, we don't care about streamlining: big nose, no spinner, spats, yes, all is different, better!" Took a look and am dizzy with P-38ish images. 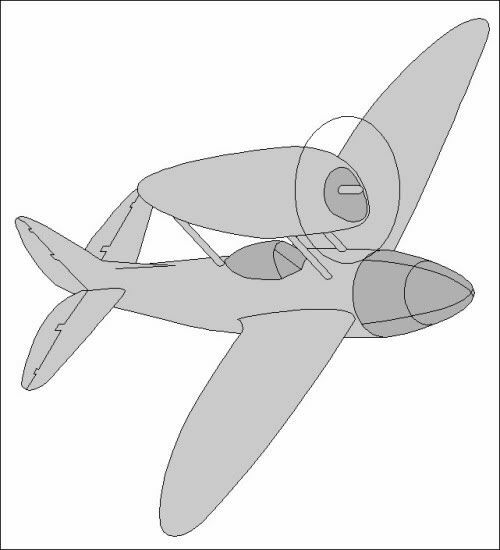 Struck me that with the attached P-38, you could do a push/pull on center section for an eight engine P-38. The center could be push only which leaves nose open for guns. Perhaps that is best. The Spider Venom is a relative of your P-38s. 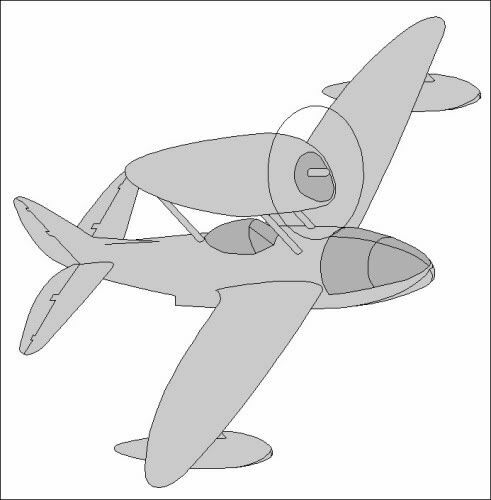 But you have inspired me to likely build some kind of P-38 variation after finishing the unorthodox twin engine jet bomber in work now. Will find at least one P-38 in some scale and see what kind of variation in 1/72 final scale I come up with. May borrow ideas from your images.